The way Americans view their living spaces has been upended with the recent explosion of the shared economy. This trend–exacerbated by the fact that nearly 30% of American adults ages 18-34 stay with their parents–has given rise to an entirely new definition of a roommate. Formerly dormant bedrooms and living spaces can be transformed into lucrative endeavors, for those bold enough to forego privacy for profit. New, hybrid buildings are constructed every day to reflect patterns of flexible, small-scale living. 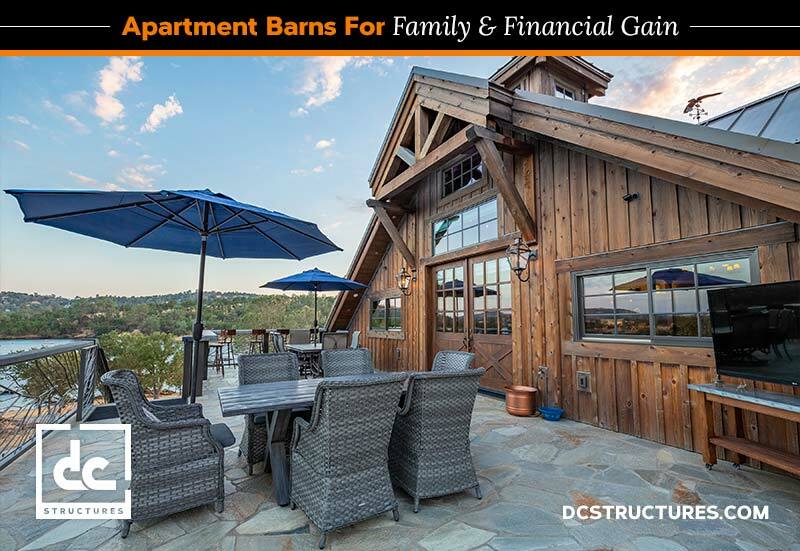 Thankfully, the team at DC Structures has evolved in lock-step alongside these recent developments, with the growth of our apartment barn kit product line. While the idea of a bespoke living space above a garage was once an upper-class luxury, we here in the Pacific Northwest have designed and built these gorgeous and affordable structures nationwide for over 15 years. Chances are, we have a project in your neck of the woods. Check out our gallery to see what we can create for you and your family. If you were considering a new garage or mixed-use building for storage, take advantage of our trusted team of project specialists and designers and consider an apartment barn for your property with living space above for extra income or the occasional visitor. You could even be so generous as to host a lingering son or daughter, or use it yourself to finally carve out that special space for your hobby or workshop. At DC Structures, we won’t just send you your materials package and head for the garage door – we are partners for the duration of your project long after completion. We know that by using our sturdy post-and-beam style of construction, combined with a durable mix of cedar and Douglas fir materials, your garage with living quarters kit will be built to last. Let us help you create a heavy-timber style apartment garage built for the 21st century. We’ll share the expertise; how you use your structure is up to you. From shared living space designs for paying guests, to stunning wraparound decks and exterior staircases that overlook your property, DC has the versatility and experience to handle the most ambitious of projects. For a simple overview of our design and procurement process, visit our process page.